Joan Marsden was a remarkable woman who made important contributions to the advancement of Biology at McGill. Her association with McGill spanned a full 60 years, from her undergraduate education, completed in 1943, to her job as Director of the Bellairs Institute in Barbados, a position she held at the time of her death, in Barbados, in 2001. After earning a Ph.D. at Berkeley, she returned to McGill to take up an appointment as lecturer in the Department of Zoology. She proceeded to work her way up the academic ladder, teaching comparative anatomy to legions of pre-med students and conducting research on marine invertebrates. Shortly after the opening of the Bellairs Institute, in 1961, she and fellow zoologist John Lewis were the first McGill professors to exploit its research opportunities. She became strongly attached to the people and life style of Barbados, and travelled there almost every year for research and personal renewal. Her favorite research subject was a polychaete worm, which she studied from ecological, physiological, and neurobiological perspectives. 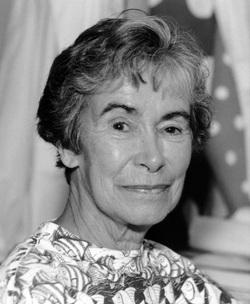 Joan Marsden was Chair of Zoology in 1969 when the Department of Biology was formed by fusion of the departments of Zoology, Botany, and Genetics. She was not only instrumental in creating the Biology Department, but she played a major role in shaping its future through her unfailing judgment and strong character. When she retired in 1987, her colleagues established a fund to perpetuate her memory by means of the Joan Marsden Lectures in Organismal Biology. Her accomplishments as scientist, teacher, and administrator are especially noteworthy for having been achieved during an era when there were few women academics at McGill. As a pioneer and role model, she led the way for the many women who followed and who today enrich our department. That too is part of her legacy. 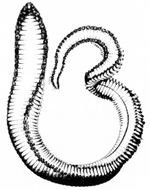 The marine worm, Polychaete, was Dr. Marsden's research specimen. Developmental constraints and the origin of the “Cambrian Explosion"
How does social information change the brain?